Emotions are such a natural part of our existence. Imagine, we can climb mountains, spend time with family and friends, do a thousand things, but without emotion what’s the point? Emotions give meaning, color and texture to our lives – taking us from elation to sorrow, excitement to resentment, satisfaction to need. 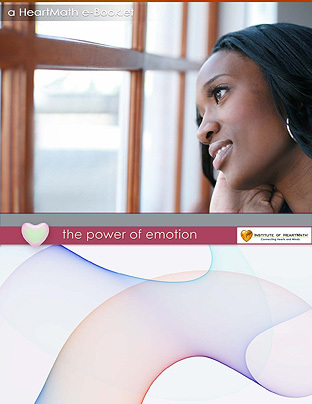 In this e-booklet you’ll learn how renewing and depleting emotions affect your body and what hormones and neurotransmitters do to your perceptions. Using the heart-based Notice and Ease™ and Heart Soak™ tools and the Quick Coherence® technique, you’ll learn what’s happening in your feeling world, recognize emotional undercurrents and shift away from perplexing emotions. If you want to effectively utilize the amazing power of your emotions, you need to become aware of which ones add quality to your life and change the ones that don’t: The Power of Emotion can help.